My husband and I did not want to go with a traditional pink room for our little girl... we wanted something modern, chic, and "unexpected"! The inspiration for Brooklyn's modern garden nursery came from two stretched canvases from the beautiful amenity home nursery collection. I wanted the room to reflect a modern garden, full of brightly colored butterflies, lady bugs, bees, flowers, and bunnies that all matched the canvases. 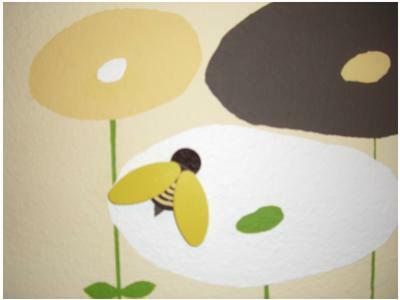 I had found a picture of a nursery that had used wall stickers to create a mural of modern flowers on a wall. 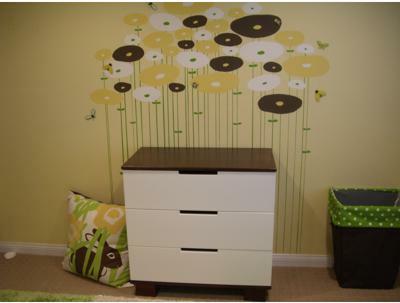 I projected the image onto the nursery wall and I painted the flowers using the colors from the canvas. I painted 25 flowers (some above 5 feet tall!) I used a level, blue painter's tape, and 2 days to get the stems flawless! The furniture is the Mercer 3-in-1 convertible crib and dresser from the Baby Letto Collection by Da Vinci. 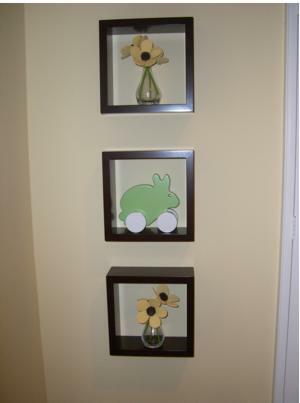 My husband made three shadow boxes that have yellow and green flowers inside, as well as a green bunny that matches the canvases. The bedding is also a key piece to the room. I wanted something very special for the bedding, something modern that reflected the colors in the canvases. I found amazing fabric at denverfabrics.com - a lime green with white polka dots. My mom came over and we created the bumper and crib skirt without a pattern! The details on the bedding cannot go unnoticed! We included white piping along the top of the bumper, and ensured all the polka dots were aligned perfectly! This took us an entire day! (I was sewing until midnight!!!) But it is beautiful! My husband also built a closet organizer and closet doors to keep all of Brooklyn's things in order! Lastly, I found a gorgeous shag rug that matched the green in the bedding and the canvas to finish the room off! I have had a vision of how my baby's nursery would look for two years... we lost two babies prior to this one. I finally got to put my vision in place and have a healthy baby on the way (I am 37 weeks now!) as well as a gorgeous nursery that my husband and I built together! 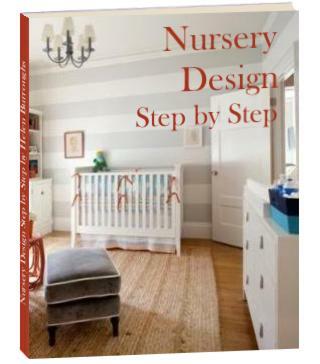 This website is awesome and has offered me great and interesting tips to design the nursery room for my baby. Bumper and Crib skirt for sale! Thanks to all for your wonderful comments! I am currently selling my crib bumper and skirt! Please contact me if you are interested in buying it! Hi - Does anyone know where to get the letters from? Also what size and font type is it? Please let me know. Thanks much !! You can buy them here. (I changed the link above too.) Sorry for the inconvenience. I just looove this room. Where did you get the pillow and canvases? I didn't see them anywhere at the link you gave. Do you think they no longer make that? Can I pay you to make me the bedding/bumper set. It's perfect! That's what I want! You can't find it in stores, that's for sure! Congrats on your baby. I know the struggle myself. What color paint is the green circle that her name is written in? Fabulous design & execution! Love it! So original! Congrats on your baby! Where did you get that crib? It's beautiful and you can tell all the love you put into it! 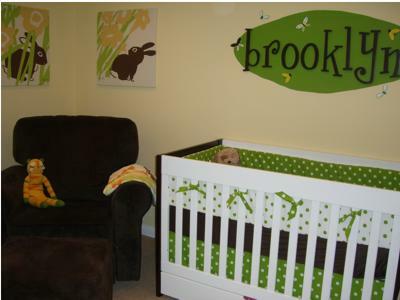 What a great job you did on this nursery. Enjoy your sweet baby girl. What an exciting time for you. 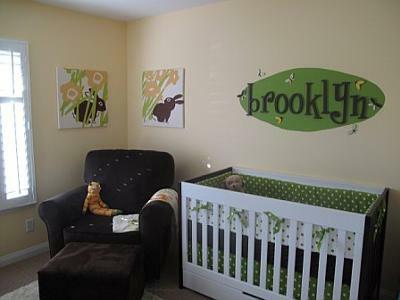 I love your nursery...it's beautiful! Congrats on your little baby girl. Your nursery is gorgeous. Congratulations on baby to be!